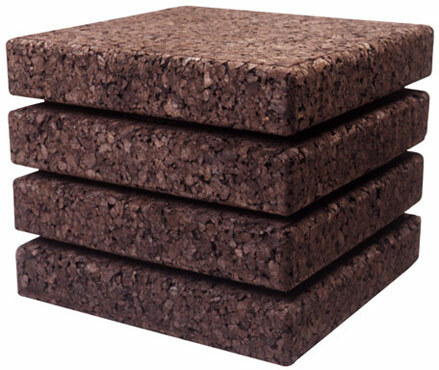 “Down to Earth” are cushions to sit on, stands or stepping-stones made out of 100% cork. Just by heating up the granulate material with steam, the natural resin gets out. After it was pressed and cooled down it glues together without any additives. 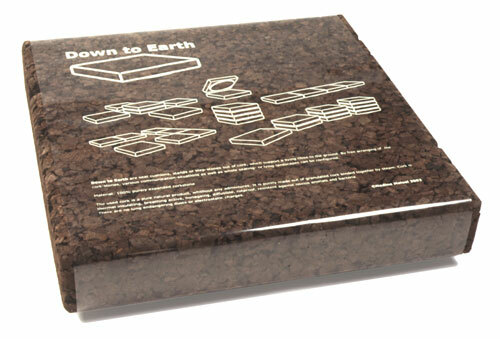 “Down to Earth” is an insulating material that stands a lifespan and is designed for living close to the soil. By arranging the cork-stones freely, one is able to configure various communication-situations as well as whole seating- or lying-landscapes. As it heat isolats it is perfect for a garden or terrace or any cool or stone floor. Measurements of one block: 46cm x 46cm x 10cm. The gap makes it seem to be flying when it is put on the ground, inspired in the stepping stones in Japanese gardens. Upside Down you see the round base with a certain width that prevents tilting. The cork used is a pure natural product, without any additives. Cork is thermally insulating, actively breathing, non-ageing, diffusible, rot proof, resistant against noxious animals and bacteria. Its use produces no lung endangering dusts or electrostatic charges.